Surfing is an awesome skill and if you know someone who would love the chance to learn how to ride a wave, then this is the perfect gift for them! 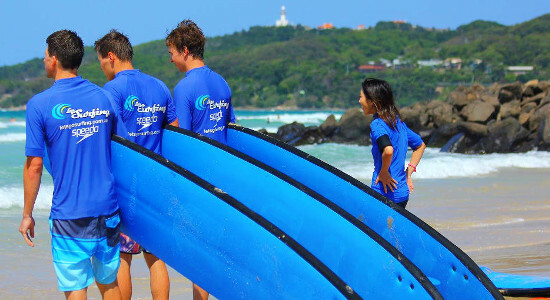 You can gift them the chance to get out on the water in Byron Bay with experienced instructors to learn the fundamentals of surfing. Check out the two different surfing gift vouchers below and choose from a 90-minute lesson or 2-hour lesson to gift. Spoil the water lover in your life with a gift voucher to learn to surf in one of Australia's top beach towns - Byron Bay. More information here! Looking for an epic Byron Bay gift? Grab this voucher for 3 2-hour surf lessons online and gift it instantly with Gift It Now. Shop online & gift instantly. Spoil someone with a gift voucher for a 90 minute Byron Bay Surf Lesson and help a lucky other hit the waves like a pro. Find out more here!